On Wednesday, Western Digital introduced its highest capacity hard drive based on conventional magnetic recording to date. The HGST Ultrastar DC HC530 can store 14 TB of data and uses perpendicular magnetic recording (PMR) with two-dimensional magnetic recording (TDMR) read heads to ensure consistent read performance. Because of extremely high areal density, the new HDDs offer up to 267 MB/s sustained transfer rate, slightly higher when compared to previous-gen drives. The new hard disks will be available in high volumes later this year. The HGST Ultrastar DC HC530 hard drive is based on Western Digital’s latest helium-filled HelioSeal platform (5th generation) featuring eight 1.75 TB PMR platters and TDMR heads with two readers to ensure predictable read performance by mitigating effects of inter-track interference. The new platform not only packs eight 3.5-inch platters and features new heads, but also uses revamped (3rd generation) dual stage microactuators to improve head positioning and rotations vibration robustness, thus, advancing reliability of the datacenter-grade HDD in general. Other ingredients of the new HelioSeal platform include a top and bottom attached motor (with a 7200 RPM spindle speed), top and bottom attached disk clamps, RVFF sensors, humidity sensors, and so on. 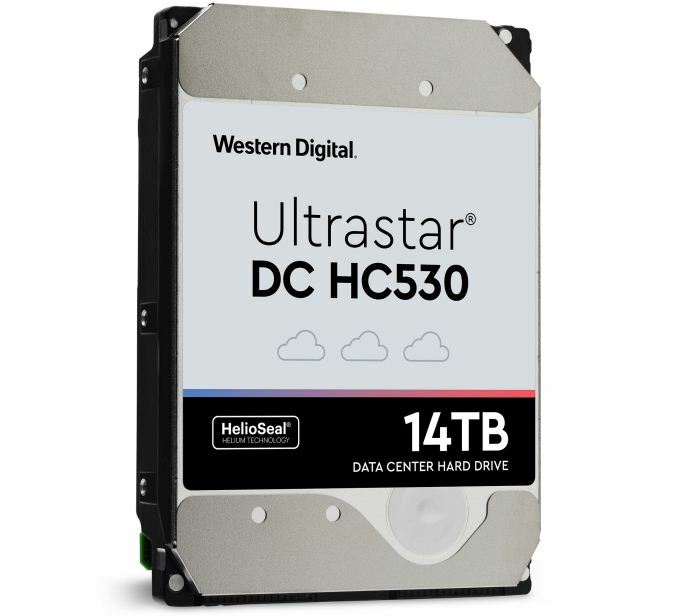 The new datacenter-grade Ultrastar DC HC530 HDDs are rated for a 550 TB/annual workload, a 2.5 million hours MTBF, and are covered by a five-year limited warranty. 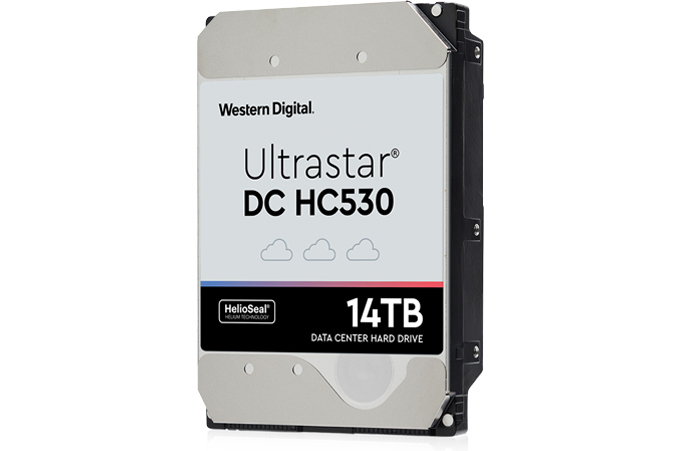 The Ultrastar DC HC530 will be available only in 14 TB capacity with 4Kn and 512e sectors. The hard drive will feature a 7200 RPM spindle speed, a 512 MB buffer, and a SATA or SAS interface. The manufacturer will offer Ultrastar DC HC530 HDDs with hardware self-encryption capability, instant secure erase feature, TCG encryption, and TCG FIPS encryption to various parties. When it comes to performance, HGST declares up to 267 MB/s sustained transfer rate, a 4.16 ms average latency, a 7.5 ms seek time. HGST’s Ultrastar DC HC530 14 TB HDD will not be the only datacenter-grade 14 TB CMR hard drive on the market: it will be challenged by Seagate’s Exos 14 featuring eight platters (PMR+TDMR) as well as Toshiba’s Toshiba’s MG07ACA featuring nine platters (PMR only). All of these drives are drop-in compatible with existing backplanes and provide a 40% more storage than their 10 TB predecessors, enabling datacenter operators to store 3360 TB of data per rack (compared to 2440 TB with 10 TB HDDs). This naturally increases storage capacity per square meter and per watt, which is what companies who run large datacenters want. Meanwhile, there is one thing to keep in mind about contemporary high-capacity hard drives. While datacenter-grade HDDs have been steadily increasing their capacity over the recent years (capacity of PMR HDDs has nearly doubled in just three years), their IOPS performance stayed flat at around 80 IOPS random reads, which means that their IOPS-per-TB performance declined from 10 IOPS per TB on an 8 TB nearline HDD to 5.7 IOPS per TB on a 14 TB nearline HDD. IOPS-per-TB is a critical performance metrics for cloud datacenters that deserves a separate coverage (so stay tuned), but in a nutshell, if IOPS-per-TB drops below a certain level, datacenter operators cannot guarantee time to data for their customers on a particular drive. Various datacenters have different performance requirements, but 5.7 IOPS per TB is considered to be the lowest viable performance for a nearline HDD (at least based on one of Seagate's presentation that uses data from operators of massive scale-out datacenters). There are applications that need a higher random performance and they will not be able to use these 14 TB drives. There are, of course, other applications that will use the new 14 TB HDDs perfectly (after all, many of HGST’s customers can use SMR-based Ultrastar Hs14 HDDs), but a lower IOPS-per-TB performance means a somewhat smaller addressable market. Western Digital has already begun to ship samples of the HGST Ultrastar DC HC530 14 TB HDDs to select hyperscale cloud clients for qualification. Volume shipments of the drives will commence in the second half of the year. Isn't Ultrastar an HGST brand? deci is just the SI prefix for 1/10 of whatever the main unit is.